'AG has no hand in decision to acquit Guan Eng' | Daily Express Online, Sabah, Malaysia. Kuala Lumpur: The Attorney General has no hand in the decision to withdraw the corruption charges against Finance Minister Lim Guan Eng and a businesswoman, resulting in the two being acquitted from the charges on Monday (Sept 3). 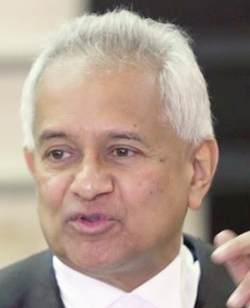 In a statement Tuesday (Sept 4), DPP Datuk Mohamad Hanafiah Zakaria said AG Tommy Thomas (pic) had recused himself in all deliberations regarding the case. "The AG had no hand in the decision to enter nolle prosequi (where Public Prosecutor does not propose further to prosecute the accused) on the charges against Lim and Phang Li Koon," he told the Star. Mohamad Hanafiah is the head of the appellate & trial division at the Attorney General's Chambers. He said he decided on the representations from Lim and Phang and the withdrawal was due to the evidence in the case having been substantially weakened. "I have perused the evidence that has been investigated by the Malaysian Anti-Corruption Commission (MACC) and the evidence that have adduced and tested under cross examination thus far, I concluded that as a result of the cross-examination of the prosecution witnesses who has testified so far, the evidence supporting the first charge under Section 23 of the MACC Act and under Section 165 of the Penal Code has been substantially weakened. This conclusion was arrived in light of fresh evidence that have arisen during the cross-examination of prosecution witnesses," he added. On Monday (Sept 3), the Penang High Court acquitted both Lim and Phang of the corruption charges over the purchase of the bungalow at below market value. The prosecution had dropped the charges and sought an order for both accused to be discharged not amounting to an acquittal. The joint trial of Lim, who is former Penang chief minister, and Phang, was in connection to the conversion of land from agriculture to residential status, and the purchase of a plot of land and a bungalow at below market value. He was charged with using his position as chief minister to gain gratification for himself and his wife Betty Chew by approving the application for conversion of agricultural land to a public housing zone in Balik Pulau to Magnificent Emblem Sdn Bhd.